Cucina povera has its roots in Italian history shortly after the end of World War I and extending all throughout most of the 20th century until the last thirty years or so. It is a style of cooking meant to use all of the ingredients in any given recipe in such a way that it maximizes flavor so that nothing is wasted. Water that is used to simmer vegetables is re-used later for stock, soups, sauce bases or to cook pasta. Leftovers are recycled to form new creations, such as ribollita, for example. Fried breadcrumbs are another hallmark of cucina povera, this time as a garnish for pasta in place of cheese. This dish is of Sicilian origin and is a classic example of cucina povera. 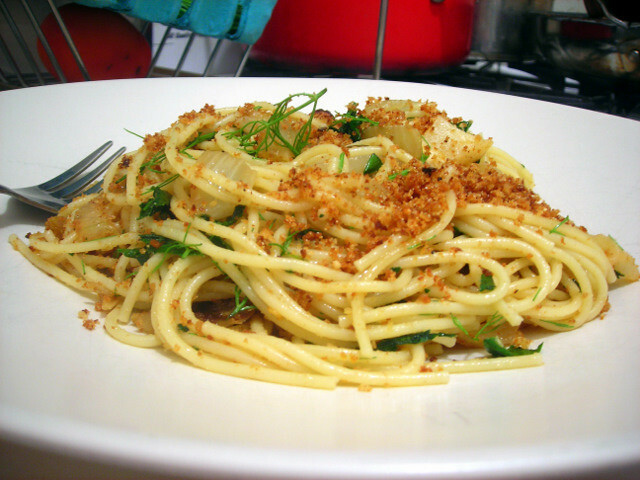 Here, thinly sliced onions and garlic are sauteed in olive oil, to which are added anchovies, fennel, raisins, then combined with spaghetti, parsley, mint and fried breadcrumbs. It’s a study in contrasts: sweet raisin and onion, elegant fennel, salty anchovy, crisp breadcrumbs and luxuriant pasta. Best of all, preparing this dish takes about 30 minutes, costs less than the price of a Big Mac and fries and serves either 2 hearty appetites or 4 appetizer servings. 02 Jul	This entry was published on July 2, 2010 at 5:05 pm. It’s filed under food, general, Italian food, summer and tagged anchovy, dinner, fennel, pasta, quick and easy, raisins, Sicily, slow food. Bookmark the permalink. Follow any comments here with the RSS feed for this post.